It’s hard to pinpoint exactly what makes jumping on a trampoline so fun and carefree. Perhaps it’s the temporary feeling of weightlessness as you momentarily pretend that you’re defying gravity, or maybe the appeal is in how much “air” you can get with the help of a friend bouncing you. For those with a background in gymnastics, trampolines possess their obvious advantages. Many people even get aerobic exercise by “rebounding” on trampolines. However you look at it, trampolines are fun backyard installations that appeal to many different people. At this point, you may or may not be thinking, “What on earth do trampolines have to do with Bradley’s Insurance?” (Okay, maybe that’s not actually what you’re thinking, but humor us.) That’s a fair question, and referring back to our original blog post about trampolines and homeowners insurance will give you some more context behind this topic. For those unaware, owning a trampoline does, in fact, affect your homeowners insurance rates as this is an additional liability on your property. As unfair as this sounds, owning a trampoline even means that you’re responsible for someone else’s injury if they’ve trespassed onto your property and hurt themselves on your trampoline. Fortunately, this is Ontario, so your neighbors are probably great people. Seeing as how simply owning a trampoline can affect your house insurance rates, the team of personal insurance experts at Bradley’s Insurance saw it fit to cover some essential trampoline safety tips in today’s blog post. 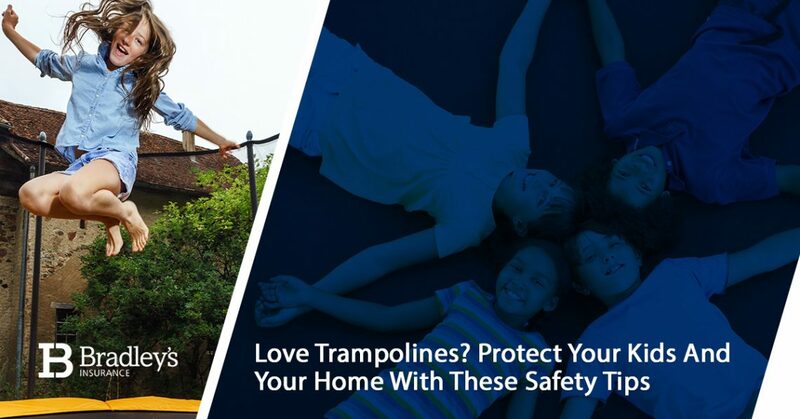 Avoiding any unwanted (but likely epic) trampoline accidents is, of course, good for you and your kids, but it’s also a huge plus for your homeowners insurance policy. By avoiding any trampoline accidents, you’ll also avoid a financial headache. Jumping safely is a win-win. At the expense of sounding like a “fun vampire,” let’s get started. When you go to pick up your new trampoline (or rather, when it finally shows up on your front porch), be careful about where you’re going to set it up. Before even buying a trampoline for your home, you’ll want to make sure that your backyard has the proper space for it. Trampoline safety experts recommend having a safety perimeter of at least three meters (ideally more) around your trampoline and that it is away from nearby trees, fences, garden furniture, poles, walls, or any installation or object that could injure your kids. Kids are adventurous and they will try to jump as high as possible, resulting in falling off the trampoline. Though falling off the trampoline is hardly ideal, it’s better to land on soft grass than just about anything else in the backyard. If your kids start jumping on a trampoline that’s improperly “installed,” everybody is going to have a bad time. Before anyone hops on the mat, you’ll want to take the time to make sure that all of the trampoline springs are in position and that the bolts are nice and tight. Not only is this important from an injury mitigation perspective, but having the right amount of tension is necessary for a good bounce! With the springs intact and securely attached at both ends, make sure that there are no hanging springs. Over time, pay attention for worn out, stretched or corroded springs — a snapped spring is no good. This tip is as easy as it is effective in preventing unwanted injuries, especially pinches, pokes, and prods. Safety pads are relatively inexpensive and, in many cases, even come with the trampoline unit. They’re designed to cover the steel frame, the springs, and the hooks that connect the frame and springs to the mat. It only takes a few minutes of bouncing on a trampoline to know that your kids will eventually land on the steel frame, springs, or the hooks — yikes. Make their landing a soft one with a simple safety pad cover. Though not as immediately essential to your children’s safety as a safety pad covering the sharp metal components of your trampoline, a safety net will help prevent your kids from falling off of the trampoline and hitting the ground. Certain trampoline models are sold with a safety net, but many do not include one. Bouncing off of a safety net may also help your kids avoid landing on the safety pad, so you’re essentially doubling up on safety. Parents like extra-safe measures like this, right? Trampolines and winter don’t mix very well, which is a bummer given that this is Canada. Trampolines and rain or morning dew also don’t mix very well. Why? A wet trampoline mat means that it is a very slippery surface, and landing on a slippery surface after catching some air is only going to spell more problems for you and your kids. Save trampoline time for those warm, dry days. If you have to go out and wipe down the trampoline with a rag before your kids start jumping, then you probably shouldn’t be out there at all. With your safety in mind — and the best deals on homeowners insurance in the Ottawa area — we’ll be back with a follow-up post on more trampoline safety tips. In the meantime, feel free to contact us for a free quote on our personal insurance services.